Before :- S.B. Sinha & V.S. Sirpurkar, JJ. For the Appellant :- Rohit M Alex, P.S. Sudheer and Ms. Anne Mathew, Advocates. For the Respondents :- Mayur Shah, Ms. Sonal Patel, Shankar Divate, Nikhil Goel, Mrs. Sheela Goel, Ms. Hemantika Wahi, Ms. Shivangi and Ms. Sangeeta Sing, Advocates. Unnamalai Ammal v. F.W. Wilson, AIR 1921 Madras 1187. Kirtikant D. Vadodaria v. State of Gujarat, 1996(3) RCR(Criminal) 147 : (1996)4 SCC 479. Balwant Kaur v. Chanan Singh, 2000(2) RCR(Civil) 719 : (2000)6 SCC 310. S.R. Batra v. Taruna Batra, 2007(1) RCR(Criminal) 403 : 2007(1) RCR(Civil) 378 : 2007(1) RAJ 1 : (2007)3 SCC 169. V. Tulasamma v. Sehsa Reddy (Dead) by L.Rs., 3 SCR 261. Gurcharan Singh v. State (Delhi Adminsitration), 1978(2) SCR 358. Bhagirath Singh s/o. Mahipat Singh Judeja v. State of Gujarat 1 SCR 839. Jayendra Saraswathi Swamigal v. State of Tamilnadu, 2005(1) RCR(Criminal) 629 : 2005(1) Apex Criminal 280 : 2005(2) SCC 13. Inder Mohan Goswami v. State of Uttaranchal, 2007(4) RCR(Criminal) 548 : 2007(5) RAJ 451 : (2007)12 SCALE 15. Devinder Singh v. State of Punjab, 2007(4) RCR(Civil) 799 : 2007(6) RAJ 179 : JT 2007(12) SC 256. Chandra Bansi Singh v. State of Bihar, (1984)4 SCC 316. Raghubir Singh v. State of Bihar, (1986)4 SCC 481. I.J. Divakar v. Govt. of Andhra Pradesh, (1982)3 SCC 341. Secretary, State of Karnataka v. Umadevi, 2006(2) SCT 462 : (2006)4 SCC 1. S.B. Sinha, J. - Leave granted in both the matters. 3. Vimlaben Ajitbhai Patel (Appellant in Civil Appeal is the mother in law of Sonalben Rameshchandra Desai - respondent No. 3 in Civil Appeal and respondent No. 2 in Criminal Appeal) while she alongwith her husband are the appellants in the Criminal Appeal. 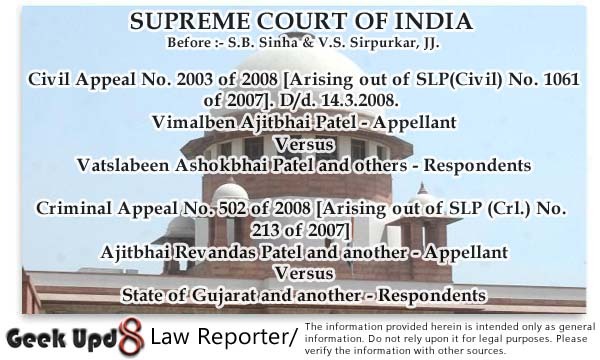 For the purpose of disposal of these appeals, Vimalben Ajitbhai Patel is being described as Appellant No. 1 while her husband Ajitbhai Revandas Patel is being described as Appellant No. 2. 4. Sonalben Rameshchandra Desai was married to Jitendra Ajitbhai Patel (son of the appellants) on 4th May, 1992. The couple fell apart. In 1993 a complaint petition was filed by the 3rd respondent against her husband and the appellants alleging commission of an offence under Sections 406 and 114 of the Indian Penal Code. In the said complaint the 3rd respondent accepted that her husband had incurred huge losses in the business in United States. Appellants were granted bail subject to the condition that they would not leave India without prior permission of the Court. Allegedly on the premise that Appellant No. 2 requires medical treatment, an application for permission was filed in October 1997 but they left India without obtaining the same from the Court. 5. An application was filed for cancellation of the bail which was rejected by the Metropolitan Magistrate as also by the Sessions Judge. The 3rd respondent filed an application before the High Court being Special Criminal Application No. 1360 of 1997. The said application was allowed by the High Court by its order dated 18th November, 1997 cancelling the bail of the appellants. The learned Metropolitan Magistrate was directed to issue Standing Warrant of arrest against the appellants as and when they returned to India. 6. On an application filed by the 3rd respondent on 24th April, 1998 the husband of the appellant was declared an absconder and a public proclamation was issued in terms of Section 82(2) of the Code of Criminal Procedure attaching her properties if she did not present before the Learned Magistrate within 30 days from the issuance of the said publication. There is nothing on record to show that the said order was served on the appellants. It, however, is not disputed that on their failure to remain present within a period of 30 days their properties were subjected to order of attachment under Section 85 of the Code of Criminal Procedure. By an order dated 5th January, 2004 the District Magistrate was asked by the Leaned Metropolitan Magistrate to take further action in terms of Section 85 of the Code of Criminal Procedure by holding a public auction of the said properties. In the said order it was wrongly sated that the properties belonged to the appellants and husband of the 3rd respondent, whereas in fact Appellant No. 1 alone was the owner thereof. iii) it is further directed that the Mamlatdar - Respondent No. 1 herein shall make reference to competent Authority under ULC Act to examine the aspects as to whether the transaction between the absconder and Respondent No. 3 can be said in breach of the condition of Scheme under Section 21 of the ULC Act and he shall also make reference on the aspects to the competent authority under ULC Act as to whether the action of the absconder and subsequently rectification by respondent No. 3 to give the possession of the petitioner as tenant can be said in breach of the conditions of the Scheme under Section 21 on the basis of which the premises came to be allotted to the absconder - original allottee. Such reference shall be made within a period of two weeks from today and the Mamlatdar shall request the concerned authority to decide the reference within a period of three months from the date of receipt of the reference. In the event it is found by the competent authority under ULC Act that the action of absconder of entering into transaction with respondent No. 3 and for handing over the possession to the petitioner as unlawful, the Mamlatdar shall be at liberty to take possession of the premises in question from the petitioner and thereafter he shall further be at liberty to hand over the vacant possession of the premises to the auction purchaser. iv) It is further directed that until the aforesaid reference is made and is decided by the Mamlatdar, the petitioner shall deposit the amount at the rate of Rs. 1,500/= per month with the Mamlatdar without prejudice to the proceedings of the reference and the said amount shall remain as deposited with the Mamlatdar. In the event it is found by the competent authority under ULC Act as an outcome of the reference and the inquiry that the possession is unlawful of the petitioner and the transaction is unlawful of the absconder with respondent No. 2, the Mamlatdar shall be at liberty to refund the amount. However, in the event it is found that the possession is lawful and there is no breach of the condition of allotment as per the scheme under Section 21 of the ULC Act, the Mamlatdar shall be at liberty to appropriate the amount in accordance with law." 9. The report of the proceedings and the outcome of the reference shall also be made by the Mamlatdar to this Court." 8. However, the appellant and her husband were not made parties therein. Against the said order, an LPA, which was marked as LPA NO. 1792 of 2005, was filed by the 1st respondent and a Division Bench of the High Court directed that the amount of rent deposited by him with the Mamlatder be deposited in the High Court and the 3rd respondent will be permitted to withdraw the same without prejudice to the rights and contentions of the parties. The said order was passed, purported to be on the premise, that the 3rd respondent had placed reliance on an order dated 13th May, 2005 passed by another Bench of the High Court in First Appeal No. 2626 of 2004 whereby her husband was directed to deposit a sum of Rs. 10,000/- per month towards arrears of maintenance and to continue to deposit the same. "6.2 The withdrawal of Rs. 10,000/- by respondent No. 2-Sonalben Rameshchandra Desai shall be adjusted against any amount which may be payable to her by Jitendra Ajitbhai Patel under any orders in First Appeal No. 2626 of 2004, in any other matrimonial proceedings or in any civil or criminal case between her, her husband and her mother in law." 10. Appellant No. 1 made an application to get herself impleaded as a party but her application was dismissed by the High Court on 11.9.2006. On or about 21st November, 2006 the High Court directed the first respondent to pay a sum of Rs. 17 lakhs to respondent No. 3 in regard to the auction sale of the property in question. Respondent No. 2, Mamlatdar, was also directed to execute the deed of conveyance and register the same in the name of the 1st respondent upon full payment. "Application is granted and warrant against both the applicant accused are ordered to be cancelled with a fine of Rs. 3,000/- (Rupees three thousand only) each and with condition to submit one new surety of Rs. 10,000/- (Ten thousand) and on executing the bond of such like amount. 2. Accused shall surrender his passport before the court." (ii) Whether in a case of this nature, the bail granted to the appellants should have been directed to be cancelled ? ii) In terms of Section 84 of the Code of Criminal Procedure, keeping in view the fact that her husband had been directed to pay maintenance @ Rs. 10,000/- per month and which having not been paid, respondent No. 3 could have prayed for realization of the said amount of maintenance from the sale proceeds of the auction sale. ii) The 1st respondent had deposited a sum of Rs. 10,000/- (Rupees ten thousand only) each month for a period of ten months which have been withdrawn by the 3rd respondent. Out of the total auction amount of Rs. 17 lakhs, the 1st respondent had deposited Rs. 4 lakhs which has been invested in a short term deposit, besides a sum of Rs. 1 lakhs. He has also deposited a further sum of Rs. 12 lakhs which sum have, however, since been refunded. The learned counsel would contend that in this view of the matter the amount deposited by him should be directed to be refunded with interest. 18. Sonalben Rameshchandra Desai is an Advocate. She filed a large number of cases against her husband and in-laws. She initially filed a Complaint Petition before the Metropolitan Magistrate, Ahmedabad, under Section 498A of the Indian Penal Code which was registered as Case No. 1662 of 1996. It was transferred to the Court of Chief Judicial Magistrate, Baroda. It has since been dismissed for default. She initiated another criminal proceeding against the appellants and their family members under Sections 323, 452, 427, 504, 506 and 114 of the Indian Penal Code, the same proceeding has also been dismissed as withdrawn. Another criminal case was initiated by her against appellant No. 2, his son and another, being Case No. 47 of 1996 under Section 406, 420, 468 and 114 of the Indian Penal Code, which is still pending. Another case, being No. 2338 of 2006 was filed by her under Section 500 of the Indian Penal Code. Another case under Section 406 of the Indian Penal Code being Case No. 2145 of 1993 was filed against the appellants. "(3) A Hindu wife shall not be entitled to separate residence and maintenance from her husband if she is unchaste or ceases to be a Hindu by conversion to another religion." (2) Any obligation under sub-section (1) shall not be enforceable if the father-in law has not the means to do so from any coparcenary property in his possession out of which the daughter-in-law has not obtained any share, and any such obligation shall cease on the re-marriage of the daughter-in- law." 28. Effect of transfer of property on right to maintenance Where a dependant has a right to receive maintenance out of an estate, and such estate or any part thereof is transferred, the right to receive maintenance may be enforced against the transferee if the transferee has notice of the right or if the transfer is gratuitous; but not against the transferee for consideration and without notice of the right." "8. We have given serious thought and consideration to the submissions made above by the learned counsel for the appellant and notice that Dhayalal Hirachand, the husband of Respondent 2 Smt Manjulaben, has been found to be a person of sufficient means and income. It is also true that there are 5 natural born sons of Respondent 2 besides 2 daughters, who are all major. It is also a fact that Dalip one of the sons had contested the Municipal Election and two other sons are carrying on various businesses. According to the Law of the Land with regard to maintenance, there is an obligation of the husband to maintain his wife which does not arise by reason of any contract - express or implied - but out of jural relationship of husband and wife consequent to the performance of marriage. Such an obligation of the husband to maintain his wife arises irrespective of the fact whether he has or has no property, as it is considered an imperative duty and a solemn obligation of the husband to maintain his wife." "Further, according to Section 20 of the Hindu Adoptions and Maintenance Act, 1956, a Hindu is under a legal obligation to maintain his wife, minor sons, unmarried daughters and aged or infirm parents. The obligation to maintain them is personal, legal and absolute in character and arises from the very existence of the relationship between the parties. But the question before us is whether a stepmother can claim maintenance from the stepson under Section 125 of the Code. In other words, whether Section 125 of the Code includes within its fold the stepmother also as one of the persons to claim maintenance from her stepson." "21. This provision clearly indicates that if the widowed daughter- in-law is a destitute and has no earnings of her own or other property and if she has nothing to fall back upon for maintenance on the estate of her husband or father or mother or from the estate of her son or daughter, if any, then she can fall back upon the estate of her father-in-law. This provision also indicates that in case of a widowed daughter-in-law of the family if she has no income of her own or no estate of her husband to fall back upon for maintenance, then she can legitimately claim maintenance from her father or mother. On the facts of the present case, therefore, it has to be held that Appellant 1, who was a destitute widowed daughter of the testator and who was staying with him and was being maintained by him in his lifetime, had nothing to fall back upon so far as her deceased husband's estate was concerned and she had no estate of her own. Consequently, as per Section 19(1)(a) she could claim maintenance from the estate of her father even during her father's lifetime. This was a pre-existing right of the widowed daughter qua testator's estate in his own lifetime and this right which was tried to be crystallised in the Will in her favour after his demise fell squarely within the provisions of Section 22(2) of the Maintenance Act." "17. There is no such law in India like the British Matrimonial Homes Act, 1967, and in any case, the rights which may be available under any law can only be as against the husband and not against the father-in-law or mother-in-law. 18. Here, the house in question belongs to the mother-in-law of Smt Taruna Batra and it does not belong to her husband Amit Batra. Hence, Smt Taruna Batra cannot claim any right to live in the said house. 19. Appellant 2, the mother-in-law of Smt Taruna Batra has stated that she had taken a loan for acquiring the house and it is not a joint family property. We see no reason to disbelieve this statement." 'According to both the schools, the lawfully wedded wife acquires from the moment of her marriage a right to the property belonging to the husband at the time and also to any popery that may subsequently be acquired by him. so that she becomes a co-owner of the husband, though her right is not co-equal to that of the husband, but a subordinate one. owing to her disability founded on her status of perpetual or life long tutelage or dependence. This right subsists even after the husband's death although her husband's right as distinguished from hers may pass by survivorship or by succession to sons or even to collaterals; these simply step into the position of her husband, and she is required by Hindu law to live under their guardianship after her husband's death.'" "24. Section 439(1) Cr. P.C. of the new Code, on the other hand, confers special powers on the High Court or the Court of Session in respect of bail. Unlike under Section 437(1) there is no ban imposed under Section 439(1), Cr.P.C. against granting of bail by the High Court or the Court of Session to persons accused of an offence punishable with death or imprisonment for life. It is, however, legitimate to suppose that the High Court or the Court of Session will be approached by an accused only after he has failed before the Magistrate and after the investigation has progressed throwing light on the evidence and circumstances implicating the accused. Even so, the High Court or the Court of Session will have to exercise its judicial discretion in considering the question of granting of bail under Section 439(1) Cr.P.C. of the new Code. The overriding considerations in granting bail to which we adverted to earlier and which are common both in the case of Section 437(1) and Section 439(1) Cr.P.C. of the new Code are the nature and gravity of the circumstances in which the offence is committed; the position and the status of the accused with reference to the victim and the witnesses; the likelihood, of the accused fleeing from justice; of repeating the offence; of jeopardising his own life being faced with a grim prospect of possible conviction in the case; of tampering with witnesses; the history of the case as well as of its investigation and other relevant grounds which, in view of so many valuable factors, cannot be exhaustively set out. 25. The question of cancellation of bail under Section 439(2) Cr.P.C. of the new Code is certainly different from admission to bail under Section 439(1) Cr.P.C. The decisions of the various High Courts cited before us are mainly with regard to the admission to bail by the High Court under Section 498 Cr.P.C. (old). Power of the High Court or of the Sessions Judge to admit persons to bail under Section 498 Cr. P.C. (old) was always held to be wide without any express limitations in law. In considering the question of b ail justice to both sides governs the judicious exercise of the Court's judicial discretion." [See also Bhagirath Singh s/o. Mahipat Singh Judeja v. State of Gujarat 1 SCR 839 and Jayendra Saraswathi Swamigal v. State of Tamilnadu, 2005(1) RCR(Criminal) 629 : 2005(1) Apex Criminal 280 : 2005(2) SCC 13]. "26. Before parting with this appeal, we would like to discuss an issue which is of great public importance, i.e. how and when warrants should be issued by the Court ? It has come to our notice that in many cases that bailable and non-bailable warrants are issued casually and mechanically. In the instant case, the court without properly comprehending the nature of controversy involed and without exhausting the available remedies issued non- bailable warrants. The trial court disregard the settled legal position clearly enumerated in the following two cases." "51. In complaint cases, at the first instance, the court should direct serving of the summons along with the copy of the complaint. If the accused seem to be avoiding the summons, the court, in the second instance should issue bailable- warrant. In the third instance, when the court is fully satisfied that the accused is avoiding the court's proceeding intentionally, the process of issuance of the non-bailable warrant should be resorted to. Personal liberty is paramount, therefore, we caution courts at the first and second instance to refrain from issuing non-bailable warrants." 41. Keeping in view the entirety of the facts and circumstances of the case we are of the opinion that gross injustice has been caused to the appellant. She did not deserve such harsh treatments at the hands of the High Court. Respondent No. 3 speaks of her own human rights, forgetting the human rights of the appellant, far less the funadamental right of life and liberty conferred on an accused in terms of Article 21 of the Constitution of India. 42. The right of property is no longer a fundamental right. But still it is a constitutional right. Apart from constitutional right it is also a human right. The procedures laid down for deprivation thereof must be scrupulously complied with [See-Devinder Singh and Ors. v. State of Punjab and Ors., 2007(4) RCR(Civil) 799 : 2007(6) RAJ 179 : JT 2007(12) SC 256]. "16. On an analysis of the various steps taken by the parties and others in the taking of possession, there is undoubtedly a delay of about 1 years and for the purpose of calculation and convenience when rounded off, the delay may be taken to be of two years. So far as this delay is concerned, the appellants have undoubtedly a case for payment of some additional compensation in equity though not under law and as this Court is not only a Court of law but a Court of equity as well, it will be impossible for us to deny this relief to the appellants. After taking into consideration the various shades and aspects of the case we are clearly of the opinion that apart from compensation which may be awarded by the Collector or enhanced by the Judge or a higher Court, the appellants should get an equitable compensation in the form of interest calculated at the rate of 7 per cent per annum for two years on the value of land owned by each land-owner. This equitable compensation has been awarded in the special facts of this case and will not be the subject- matter of appeal, if any, under the Act on the amount of compensation." An order for release on bail made under the proviso to Section 167(2) is not defeated by lapse of time, the filing of the charge-sheet or by remand to custody under Section 309(2). The order for release on bail may however be cancelled under Section 437(5) or Section 439(2). Generally the grounds for cancellation of bail, broadly, are, interference or attempt to interfere with the due course of administration of justice, or evasion or attempt to evade the course of justice, or abuse of the liberty granted to him. The due administration of justice may be interfered with by intimidating or suborning witnesses, by interfering with investigation, by creating or causing disappearance of evidence etc. The course of justice may be evaded or attempted to be evaded by leaving the country or going underground or otherwise placing himself beyond the reach of the sureties. He may abuse the liberty granted to him by indulging in similar or other unlawful acts. Where bail has been granted under the proviso to Section 167(2) for the default of the prosecution in not completing the investigation in 60 days, after the defect is cured by the filing of a charge- sheet, the prosecution may seek to have the bail cancelled on the ground that there are reasonable grounds to believe that the accused has committed a non-bailable offence and that it is necessary to arrest him and commit him to custody. In the last mentioned case, one would expect very strong grounds indeed. " 47. Reliance has also been placed on I.J. Divakar and others v. Govt. of Andhra Pradesh and another, (1982)3 SCC 341. The said decision was rendered under the Industrial Law. Regularization was directed to be provided to the workmen. A Constitution Bench of this Court in Secretary, State of Karnataka and others v. Umadevi and others, 2006(2) SCT 462 : (2006)4 SCC 1 opined that all such decisions shall stand overruled. 49. We may also notice that after the arguments were over, a strange submission was made before us. Learned counsel for respondent No. 3 submitted that he may be permitted to withdraw from the case and the 3rd respondent be allowed to argue in person. Such a submission was not expected from a counsel practicing in this Court or from a party, who herself is an Advocate. We deprecate such practice. ii) The 3rd respondent shall refund the sum of Rs. 1 lakhs to the respondent with interest @ 6% per annum. vi) The 3rd respondent shall bear the costs of the appellant which is quantified at Rs. 50,000/- (Rupees fifty thousand) consolidated. More such judgments sould come out from courts. There are many such judgements, and we are doing our best to make them reach to the public. Stay connected for more updates.